Good gosh, am I cute! I'm starting to lose my what??? I guess bald is beautiful! 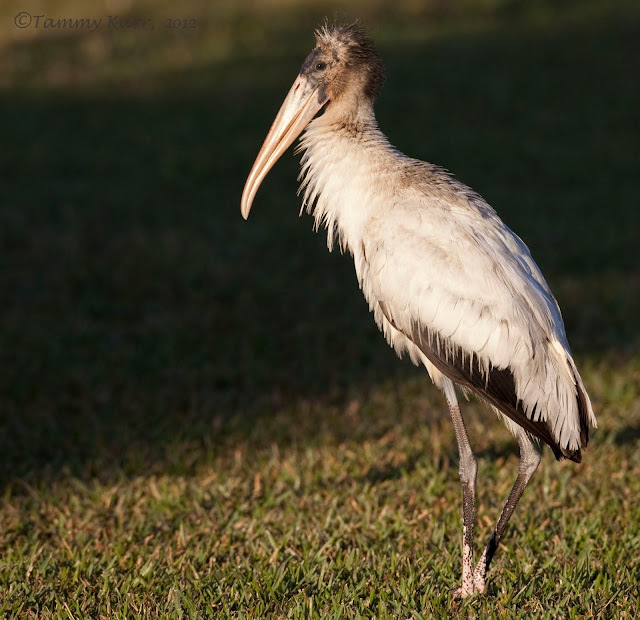 As juveniles, Wood Storks are bundles of soft white & brown cuteness. Their long bills are smooth and yellowish. By their 3 summer, things begin to change. One by one their fluffy feathers give way to their scaly replacements. By 4, the Wood Storks sweet, charming appearance has completely transformed into a prehistoric look! 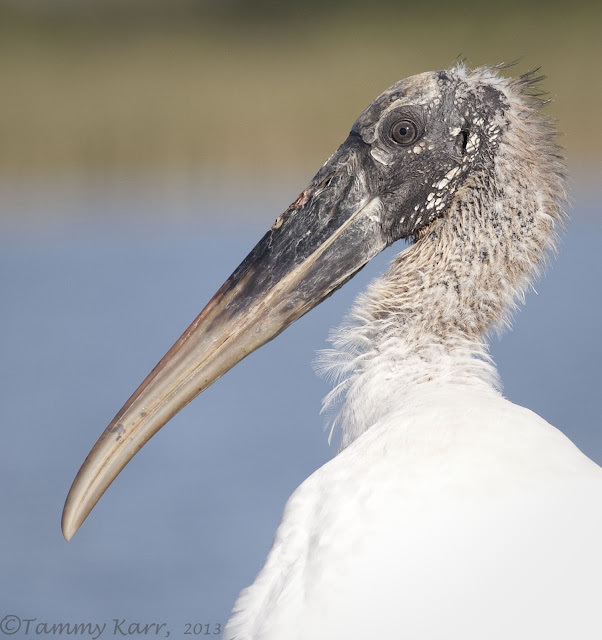 Wow....I never really thought about how juveniles had a feathered neck and adults didnt...I always just looked at bill color to tell them apart. Amazing pics, rad post. They are very photogenic Tammy......good shots again. Nice shots Tammy, not the best looking of birds I have to say but appealing to many I'm sure. The second is my favorite, so sharp and fine detail, well done. Not the best looking birds that I have ever seen Tammy, but still cracking photos of them! Love it, it's baldness gets me there. Beautiful Stork, thanks Tammy. Que animal más bonito y que bien le has fotografiado. Preciosa también la foto del pelícano. Amazing species and beautiful images .. Congratulations Tammy ..
Good lord Tammy I think you must have them as pets in your yard you are so close -;) terrific pics, I just love em. Wonderful clarity here Tammy and informative too. Your right about the prehistoric look, something only a mother could love! Beautiful photos, although I'm not sure I'd call the birds beautiful! Great shots, Tammy! So cute to so non cute. lol. Good subject ,I never really gave it much thought. Good choice of bird. HA! This is sooo funny. You got a great deal of detail here too. Nice shots Tammy, thoseStorks really seem to trust you. It's with good reason of course, as no one has done so much as you to raise awareness and sympathy for the growing epidemic of Stork Pattern Baldness. Their necks look like sand sea cucumbers too. Thanks for the chance to see these storks so close up. Nice progression of their appearance and sooooo cool to marvel at! Now you made my Nay! Your post is so funny and the pics are just brilliant! Estupendos primeros planos, con una excelente nitidez. Stunning images of this rather strange bird. Fun to see new species, so thanks for sharing with us. Great close up and personal shots Tammy. They do look gorgeous while flying with their black tipped wings. Great shots of a young representative of a threatened species here in Florida. It seems we have an abundance of them locally (west central Florida) but in their historical home in the Everglades they continue to decline. Hope we see lots more "balding babies"! Really nice shots Tammy, considering the subject matter LOL! Wood storks aren't the prettiest bird, but I still find them likeable! Great captures. These guys don't rank up there with other beauties but still pretty in flight! The bird in the second image looks surprised about something! Nice set of pictures. Nice pics and funny comments this time too, Tammy ! Have a nice weekend in Florida, and take care ! Haha! Perhaps this bird has no feathers on his head so that he is more aerodynamic! Fun post! Oh my!! Cute to be sure. Great photos Tammy, love the detail. What a beautiful shots of these "ugly" birds...!! They are not pretty with their ugly heads, but so funny and special to see. Amazing how you photographed them so well. My compliments!! You've got a wonderful banner at the top of your blog!! Tammy, cute post! I love the Wood Storks. Awesome closeups. Have a great weekend! 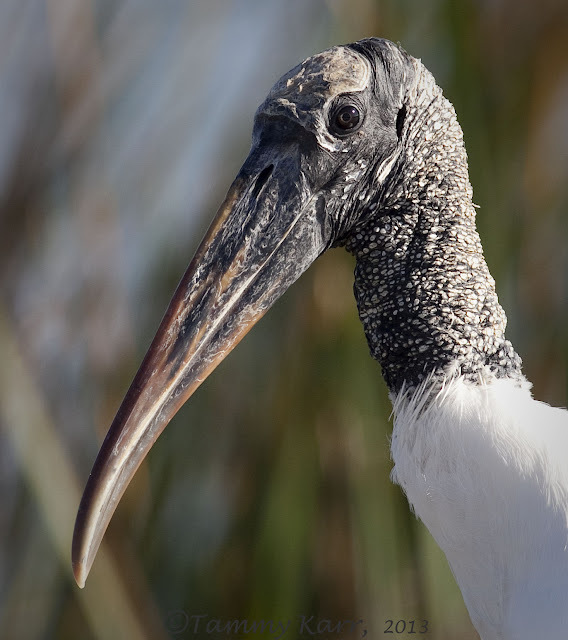 Excellent documentation of the physical changes that take place as a Wood Stork ages. Superb photographs, fantastic detail!